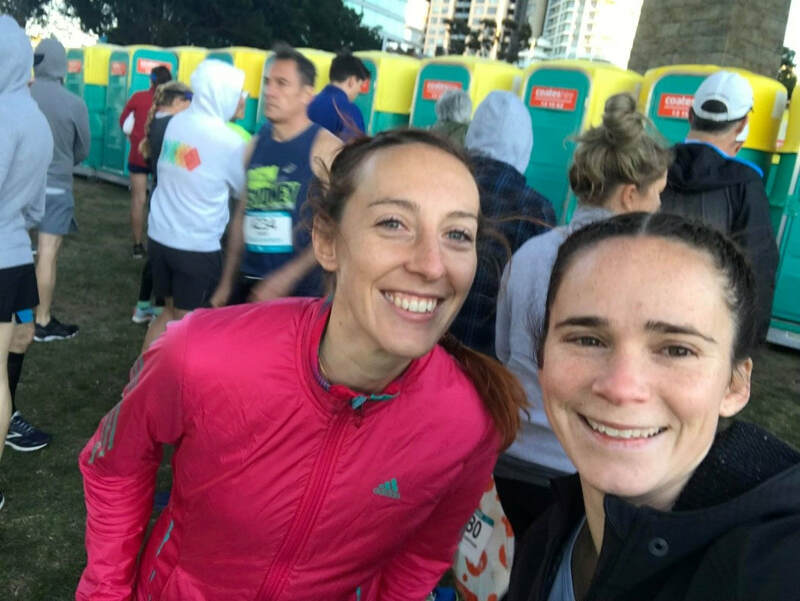 Marnie Dyson and Laura Simon run their first marathon in Sydney. I wonder if Eliud is in pain like us today? Probably not. It is difficult to know where to start the race report, because the marathon definitely does not begin on the day of the race. It begins a lot earlier. I have been speaking about trying a marathon for a few years now. But I never had the time / motivation / consistency / discipline to do it. It was my 2018 resolution: Being back to running in competition and running a marathon in less than 3h10m. I think in January I went to two long runs on Sundays with the Flyers. It was very hard to wake up at 5am on a Sunday morning to run 21km at 6am… At this stage my fitness also meant that I would struggle to stay awake the whole day after that. I tried to begin training seriously with Marnie but constant back problems made me stop training more than once. ​Advertising break: I went to Transition Chiropractic to visit James Straciwa. This helped a lot. Before visiting him, my back was blocking every two times I was running. After visiting him, I did a full comeback to fitness and marathon preparation with only blocking my back twice. This is when Marnie watched the commonwealth marathon. 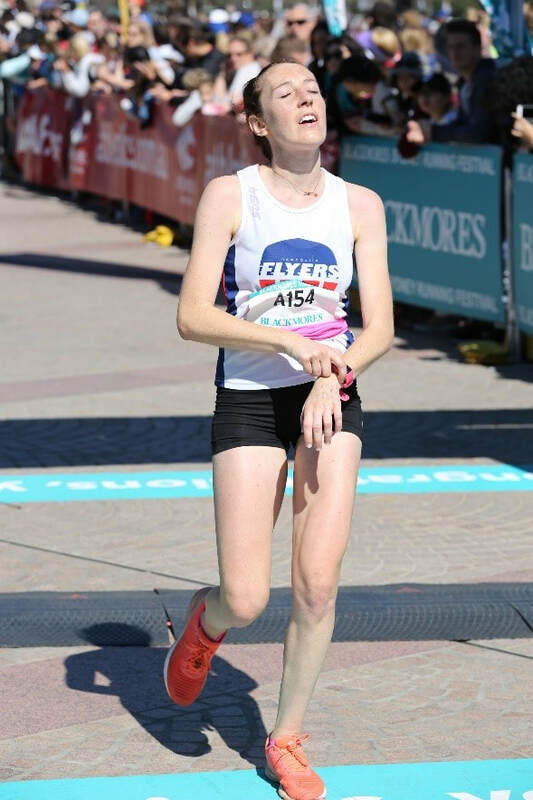 Seeing the Scottish leader collapse and the Ozzie victory gave her a lot of motivation (and also made her realise that we should actually train for it). Marnie (thank you so much!) motivated me to really comeback to training. I made her register at the Flyers. At this stage, I decided that a realistic goal for marathon this year would be 3h30. I am lucky to have a flexible timetable; I committed to go to most of the Flyers long runs, Tuesdays and Thursdays interval trainings. It is so much better to run with a group! At this stage, it was better not to look at my watch to avoid comparisons with trainings I use to do a few years ago. Without worrying about the watch, fitness quite rapidly came back. We even ran the bay-to-bay half marathon mid-June. 1h33m for me. It was a few minutes away from my PB, but I was very happy with this time. It validated the good progress thanks to training with the Flyers. I do not want to give names because I am too afraid to forget someone. But I want to thanks so many people. I received so many precious advises, a lot of motivation and a lot of encouragement from the Flyers during the whole preparation, especially the Sunday long runs. I am also very thankful to the Flyers who kept running after their long runs to help me do the distance I wanted to achieve. My marathon preparation went very smoothly, I was now aiming for 3h15m. My back blocked mid-august after a 90km week and a 100km week. It was frustrating, but now I think it was probably for the best. I am not sure my body was ready to endure 5 or 6 weeks that hard. 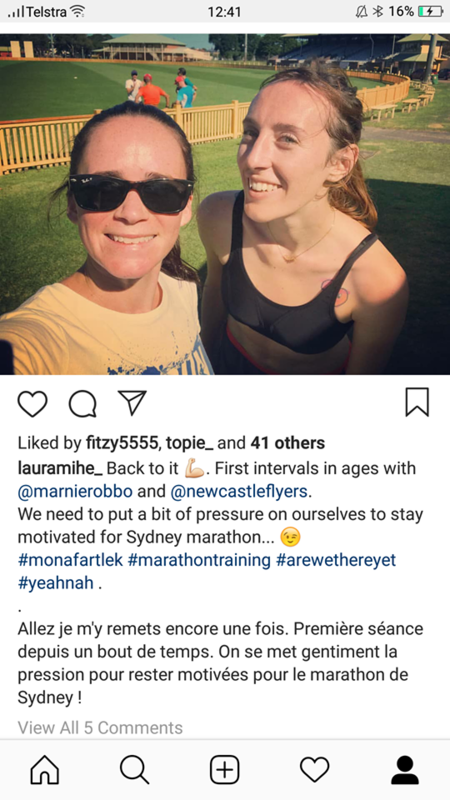 Before Lake Macquarie half-marathon, I knew I was fit. One week before, I did a good red train (and more kms to get to 36km…) and I recovered well from it, which is a good sign. I went to run under 90 minutes hoping to be easily under. The 1h25 were a surprise, it is my PB. I did not think I was able to do my PB, and run 8 minutes better than at Bay-to-Bay (!). ​I did one last big training two weeks before the marathon (26km including 2x10km at marathon pace). I was now aiming for 3h10. The few runs I did felt difficult, like if I was not recovering from the half and the 2 x 10km. I caught a cold. It was actually just a small cold, but 10 days before the marathon, for me it was like the flu (I think we call that the man flu here :-). I also painted the ceiling in my house using a ladder and mostly being on the tip of my toes. After that, my calves, especially the right one felt tight and painful. I even went to get a massage 5 days before the race. At this stage, speaking with Marnie and with my French friends running the Berlin marathon helped. It looks like most of people have a weird tapering time. My boyfriend Sean drove Marnie and me to Sydney the day before the race. We were both excited. In the city, we were surrounded with runners. We were in a hotel close to the start, so also surrounded by runners. It was a really good weekend. We went to pick our bibs and then have a drink at The Rocks (water for Marnie and soda water for me). We wanted to have dinner early so the digestion is fully finished when we wake up - you all know what I mean. We went to an Italian place to get pizza AND pasta. Our last night of sleep was ok, with the alarm set at 4.30am, two hours and a half before the race. Light breakfast, tea… I was still worried about my calf and Marnie advised me to run with my training shoes, not my racers. Which was a very good advice. Weather was nearly perfect: I asked Felicity to order a cool day for the race and she did it. Temperature was perfect. There were a bit of wind, but it did not bother me that much during the race. I would choose wind against heat anytime. We walked to the start a bit stressed, but mostly happy to be here. We saw the half marathoners running the first kilometres of their race. We took picture with a kangaroo, on a podium with view on the bridge, and with the Opera (the finish line!!!!) in the background. Marnie and Sean said all these things were for tourists. Luckily, with my strong accent, I am allowed to do every touristic thing ever in Australia. Warm-up, toilet queue, toilet selfie (see picture below), toilet queue again. After my half-marathon in Lake-Mac, I asked for a preferred start and it has been accepted. When I understood that in this race “preferred start” and “elite start” was the same, I was so excited. I nearly asked Sean to take a picture of me in front of the “Elite entry”, but I did not do it. I should have done it. I felt so important to be in this start. It was a good experience in itself. First of all, I was with all the best runners, it was very impressive and motivating. We had 200m road for us only to do slides and finish the warm-up. If I wanted, I could have started on the first line easy, it was not a fight at all to be there. I did not do it, but again I should have for the great photo. J Also, there were 10 toilets for less than 200 runners. I am a bit obsessed with toilets, but it was one of my main stress before the marathon^^. I spoke with some of the girls representing Tasmania who were like me very happy with the weather. I also spoke with the “French Maid”. He was running to beat the World record of marathon dressed as a French Maid. He had to do better than 3h26. He finally made the world record, as well as three other people in this race including a guy running the whole marathon in thongs with a surfboard. Count down: 3 minutes, first energy gel, 2 minutes, 1 minute… I was not stressed anymore, mostly excited and checking if my watch was ready to go. Being in the elite/preferred start was amazing for the experience and all the things listed above. However, it was not great to help me find my pace. Everybody around was faster than me and I had to be very concentrated to keep my pace. Everybody was going passed me, but I was thinking to all the advises I received and tried to keep my own pace. Also, this part of the race is not flat at all, which was not helping me to find my pace. I was going at 3’50, then slowing down to 5’ according to my watch. I calculated that this is an average of 4’25, not too bad (aiming an average of 4’30 for 3h10), so I stopped looking at my watch every 200m. I was feeling good and easy enough to enjoy running on the bridge. Around the 10th kilometre, my right calf began to be painful (fuc**** ceiling painting). It was early, too early. It did not slow me down, but it gave me a bit of stress and overthinking. I was still feeling quite easy, which is normal at this stage of the marathon, and my brain was still fresh enough to think. I was very frustrated because feeling fit, but afraid that my calf would not make it until the end. I was afraid of cramping. I found a good group of guys who were going at my pace (4’15 to 4’20 most of the time). I was aware of being too fast compared to the 4’30 planned. But I was feeling easy and relaxed, except for my calf. At a moment I was asked what was my aim, I said 3h10 and the guy was aiming for the same thing (qualifying for Boston for him), so I felt ok with my pace. At the 17th km, my calf began to be very worrying. I was feeling like a needle was stuck in it. It was the only thing I could think about. I even thought about stopping because 17km is still very early and I was very anxious. I was feeling frustrated to be fit and to have this calf issue. I was thinking about what everybody would think if I stop and so on… Until I came to the conclusion (km20), that I should just keep going because I was feeling good, and the only good reason to stop would be an actual cramp, not only to be worried about a cramp. I do not know why it took me nearly 10km to reach this conclusion. From the moment I decided that, everything was better. The pain was still there, but it was not disturbing my pace and I was enjoying a lot better the race. It was 42’10 for this 10km. I am not sure it is a classic for a marathon, but my favourite part was from 20 to 30km. My stress was gone and I was just enjoying it. Endorphins kicking in? I kept my pace and people around me were mostly slowing down, so this was very motivating. At km 21, I saw the French Maid not too far in front of me. I wanted to reach him to congratulate him (I think I was high), so I accelerated and spoke a bit with him before passing him. At that time, I was having very positive thoughts like “The 27th km is soon, then there is only 15km, you can do that easy and your calf won’t cramp”. I was looking all around me and enjoying Sydney. I knew Sean was waiting for me at km 25. So I was thinking about what I was going to tell him. My choice went to “my calf is painful”; I think I needed to share. After Hyde Park, there were a lot more of spectators so I was afraid to miss him. He was actually into a small and calm street so I really had time to see him; it has been very helpful and helped me not to think about the race for a few kilometres. The 25th km was the second fastest of the whole race. I think I wanted to impress Sean who said no to a cruise on a boat with free booze in order to come and support me. I reached the 27th km, (fifteen to go) and then it was all quite easy until the 30th km. I just remember running in front of the pasta/pizza place we ate at the day before. Just after the 30th km, there were a U-turn where it was possible to see runners running not too far from you. I saw the 3h00 pacers. They were probably two minutes in front of me, not more. ​I was feeling good, I was able to accelerate a bit and was very convinced “OMG YOU ARE GOIND TO MAKE IT”. I was very optimistic because I remember looking at the race profile and everything was flat after the 32nd km. Also Jordi told me everything was flat the last 8km, and I was still feeling good. And especially: it was my first marathon, I had no idea about how everything can change in the last kilometres. 33km to 35km: did they lie to me? At this stage, the race was supposed to be flat. But it was not. They did not say on the website that from the 33rd km, it was actually uphill until the end. I am sure it was ‘Publicité mensongère”/ false advertising. Jordi, did you lie to me? Jordi, tu m’as menti? – this is a nice rhyme in both language. I am now thinking about the Uber driver from yesterday who told us it was a tough course. I am also thinking about Paul who said that he was surprised on how good you can feel at km 30 and how bad at km 35. I was feeling a lot less comfortable and I was slowing down, but not that much. All my body was painful. At least I was not feeling my calf anymore. I was beginning to feel part of my body that have never been painful before, like the upper part of my back. I knew I was in front of my 3h10 aim. I knew that I could slow down and still make it. So I just kept running, at a slower but steady 4’40 / 4’45 pace. I was still passing people. I was making calculations into my head. How long is it going to be until the end? When I realised it was still half an hour to go, it became very difficult mentally too. I was not at all looking the landscape around. I was just concentrated to keep running. One leg in front of the other to get to the end. I was not too far behind the 3hours, so I think I was passing some runners who were aiming sub3, and were slowing down knowing they were not going to make it. Passing people rather than being passed is a lot better for motivation. I was going to reach my goal, so it was easier for me to stay concentrated until the finish line. The 17 degrees were feeling a lot hotter too. I was feeling lucky to be running on a cool day. It was 44’47 for this last 10km. 40km to 42.2km : Am I there yet? Are we supposed to enjoy this part of the race? Because I did not. I just wanted to be done with this. Around km 40, you can see the Opera. It looks very close. But it is still 2.2km, 10 minutes. When I passed km 40, it was 2h53’30. I should finish under 3h05. I was satisfied, but definitely did not realise how happy I should be. I just wanted to be done. I was looking at my watch every 100m. I do not know how, but I missed the km 41. Some spectators told me it was 800m to go. I began to appreciate a bit and to understand it was finally the end. I was able to accelerate a bit, I thought about smiling for the final photo. But it looks like I did not do it. So it was 3h03’42 real and 3h03’48 official. ​I am VERY HAPPY with the time. I went faster on this race than I did on the bay-to-bay half-marathon three month earlier (1h33). It is really amazing how my body was able to come back to previous level of fitness and then to adapt for the marathon. I think I did the best possible time for this race. The end was painful and I slowed down a bit, but I never crashed. Sean was at the finish line, so happy to find him I forgot to take my finished T-shirt…. But that is ok, I have my medal! I just have to convince him to put it on the wall of the living room now. He was following Marnie and me on the phone application. He told me Marnie was also on track with her objective. We waited next to the finish line and I even succeeded to get some room at the barrier to support her in her finish. 3h39’55. Amazing for this 800m runner, who also ran her first half marathon this year (bay to bay). A few hours later, Eliud Kipchoge saw our performance when he woke up in Berlin. He called us for advice. And then you all know the story.